When you pack your bags and move to AmiSa, don’t expect a whole new life. It will be similar to the one that you currently live, but you can be sure that it will be different. You’ll still have to face a boss, who happens to be none other than yourself. You’re also obligated to wear a suit, only this can mean your favorite pair of multi-colored Speedos or the tight black diver’s attire. You’ll be surprised to learn that terms like “rush hour” and “business deal” can also take on stress-free meanings. At AmiSa, every day is indeed a holiday. 1. What type of development is AMISA? Amisa is a 5-hectare mixed use hotel and residential resort development of ROBINSONS LAND CORPORATION (RLC). It is the first leisure project of RLC, the real estate arm of the JG Summit Holdings owned by Mr. John Gokongwei. It is affiliated with Cebu Pacific Air, Universal Robina Corporation – makers of Jack n’ Jill, C2 Green Tea and other leading branded food products in the Philippines, sun Cellular and Robinsons Savings Bank. 2.Where is Amisa specifically located? 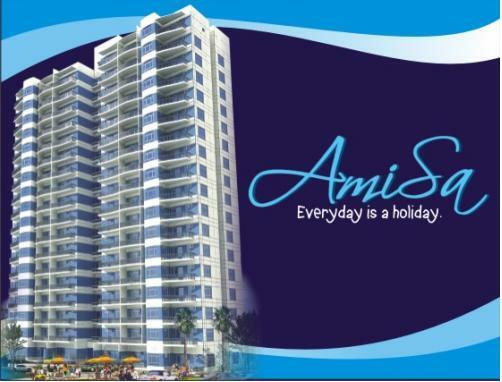 Amisa is located in Punta Engaño, Lapu-lapu City, Mactan Island Cebu. It is a 10-minute drive from Mactan Shangri-La Hotel and Hilton Hotel, 15-minute drive from the Mactan Airport, and 45-minute drive to Cebu city’s Commercial and Business district. 3. Why is the development named Amisa. Amisa is the Sanskrit for object of enjoyment, a pleasing or beautiful object. In Amisa, you will find the happiness you’ve been longing. It’s a stress-free community, a place where everyday is a holiday. 4. How big is the resort and what are the resort components? 5. What part of the residential resort will be launched first? We will first launch the residential community. The first buildings to be launched are 14 and 18 storeys. Together with the residential towers, construction of the amenities such as the clubhouse and the swimming pool are also scheduled. 6.What will the style of the resort be? Architectural Design: Taking inspiration from Gold Coast architecture, Amisa boldly responds to the rapidly increasing demand for modern leisure island living. The resort development was conceived to allow its users to enjoy an active interaction with nature while preserving and enhancing its environment. The concept of the towers soaring above the rest of the natural site takes advantage of the picturesque views it offers. All units are guaranteed either a view of the meticulously planned amenities, the perfectly manicured resort, or the ever-soothing sea. Such confidence and exuberance definitely established Amisa as the defining hallmark of the island. Every unit is also provided with a spacious balcony which cantilevers beyond the main structure of the building as a more overt sculptural composition. The union of the curvaceous balconies to the commanding structure mimics the smooth waves and the infinite expanse of the ocean. The balconies enliven the buildings with their deep and fluid shadows. Daylight enhances the beauty of this development through the large windows. The main aim of the landscape architectural design for Amisa is to provide appropriate settings for the three major architectural elements the project - the residential condominium buildings, the hotel and gaming complex. These building complexes are set amidst an environment that provides a holiday ambiance and relaxing, stress-free, fun setting that residents and guests will want to return too often, a total escape from the blandness of urban life. 7. Who will design the development? The masterplan was designed by Architect Albert S. Yu of ASYA Design Partner. Some of the projects of ASYA includes RLC’s Mackinley Park Residences, Otis888 Residences, The Trion Towers, Woodsville Mansions, SM Mizza Residences, Anchor Land Holdings Inc. , Mayfair Towers. ASYA Design Partners was awarded as one of the top 10 Architectural Firms in the Philippines from the year 2004 to 2007. Architect Yu is also one of the founding members of the Philippines Green Building Council, and organization that promotes green architecture. On the other hand, the landscape architecture will be handled by Architect Paulo Alcazaren of pGAA Creative Design. PGAA did projects for the Banyan Tree Group in Indonesia, the song Be Gold Resort in Vietnam, the Hainan Mandarin in Hainan China, The Royal Mulu Resort Aviary in Sarawak, the Sutera Harbor project in Kota Kinabalu, Sabah and NTUC Resort in Sentosa, Singapore. PGAA is also responsible for Landco’s Playa Catalagan. Lastly, Petra Konsult and Associates Inc. headed by Engineer Uldarico Trawon, will handle the beach development headed by engineer Uldarico Trawon. Petra consult has done projects for Tagaytay highlands International Gold Course and Punta Fuego. 8. For the residential units, what specific unit types do you offer? 9. What are the sizes of the units? 10. Are there available parking slots for sale? 11. What are the views from my units? 12. How long is the beach frontage? 13. Is it a private resort? Yes, admission will be strictly for residents and their guests as well as guests in the hotel.